I’ve featured this blush in my November favorites already, and blogged about it in my haul post, and I figured it’s time to do a proper review. I won’t say how much I love it, as I think my favorite post already covers that part ;-). The blush I’m talking about is 27 Rose Initiale. When Lisa Eldridge told me (well… us) that she used it on Keira Knigthley, and I saw how stunning that looked, I had to get it too. The color is gorgeous, it’s a very natural pink, which is perfect if you want to look like you don’t have any make up on. There is a slight, very slight shimmer in the pan, but you barely notice it on the cheeks. It’s not very pigmented, which makes it very blendable. It has a slight rosy scent to it. If you know how the Lancôme Dolls Eyes mascara smells like, the fragrance is similar. It comes in a velvet pouch, which I think is pure luxury. The packaging is their signature black plastic casing, which is very chic – if there are no fingerprints on. Inside there is a great mirror, which I use to put blusher on, as it’s more focused on the face whereas the big mirror is just… well, big. I don’t use the brush that comes with it, as I don’t think it applies the blush nicely. I like to use my mini kabuki brush of Ecotools. The staying powder good, it’s still on my face after an entire day of university. I think it holds for about 8 hours, though I have to be honest, I didn’t time it ;-). 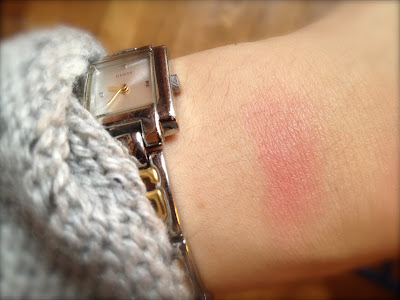 I made some pictures of me wearing the blush, but somehow my MacBook won’t recognize the SD card or my camera, boo! Will try to see if I can get it uploaded soon, and post it as a FOTD. All in all, I love it loads, and though it is very expensive, I’m definitely going to save up, and get another color. These are just great, and worth saving up for! Have you ever tried a Chanel blush, and which color do you love the most?